As most of you likely heard (and if you haven’t, GOOD NEWS), after more than a year of disappointing headlines, which were promptly retracted; Voyager 1 FINALLY broke through the charged particles surrounding our solar system – officially reaching “interstellar space.” At least; it reached what we believe to be interstellar space. Oddly enough, this region isn’t well-defined. Regardless of the semantics, this is still a pretty monumental occasion. After all.. we – as in, humankind – built something that now wanders the space between stars. How cool is that? 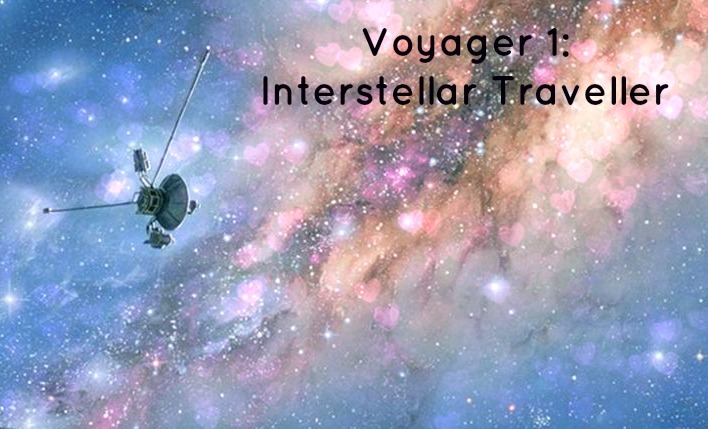 So, in celebration of the Voyager program, we have complied some cliff notes about Voyager 1. Before Voyager 1 and 2 set sail for the stars, special golden disks were created to travel along with them into interstellar space. The contents of the said disks were selected by a NASA committee, led by Carl Sagan. 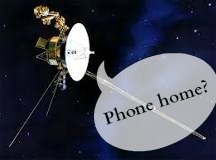 (Who I can’t help but think about each time I read about the Voyager probes. The project meant so much to him, I just know that he would be thrilled with the news) Together, they chose 116 various images of Earth, Earth’s people, our animals and a variety of sounds, which include those made by wind, thunder and animals; like song birds and whales. They also added a collection of music by artists such as Beethoven, Mozart, Stravinksy and Blind Willie Johnson – with audio clips of greetings in 55 different languages. 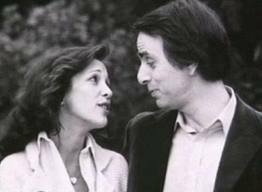 However, the most little-known tidbit about the record deals with Sagan and his soon-to-be-wife, Ann Druyan. Sagan and Druyan thought it would be interesting to include an EEG on the disk, on the off chance that an alien civilization WOULD find it – and perhaps be capable of reading human thoughts. Ann had prepared a script to recite during the process, but just prior to its recording – on In June 1, 1977 (just three months before Voyager’s launch) – she and Sagan discussed getting married over the phone. This would have an obvious effect on the outcome of the EEG. Ann herself even said, “My feelings as a 27 year old woman, madly fallen in love, they’re on that record. It’s forever. It’ll be true 100 million years from now. For me Voyager is a kind of joy so powerful, it robs you of your fear of death”. This artist rendering depicts the distances separating objects in our solar system – starting with the orbit of each of the planets, voyager’s position in respect to it and the outermost portion, which Voyager is still a LONG way from getting through. The scale bar is in astronomical units (with 1 AU representative of the approximate distance separating the sun and Earth: 93 million miles [or 150 million kilometers]). Each rung is about ten times the distance of the previous one. Now, with that in mind; Neptune – the most distant planet in our solar system – is about 30 AU from the sun. And since I know some of you will ask, Pluto (poor lil’ dwarf gets excluded from the fun stuff) is around the same distance on average. (At its most distant point, it can be about 49.3 AU from the sun) As you can clearly see, Voyager 1 has surpassed all of the planets; coming in at a staggering distance of 125 AU (this is about 11.62 billion miles (18.7 billion km) from the sun!) Yet, it still isn’t anywhere near the Oort cloud – home of the icy comets. 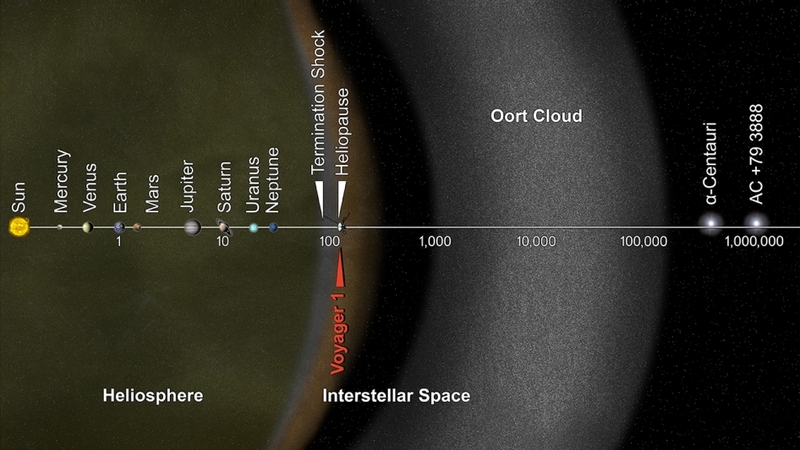 Assuming no major surprises are ahead, it will still take 300 YEARS for Voyager to reach the Oort cloud. Moving onward, it might take 30,000 years to fly beyond it! If you think that’s crazy…. Apart from our own sun, our next celestial neighbor resides in the Alpha Centauri system (okay. technically, this is a triple star system, but you get the idea) – some 4.3 light-years (or about 25.6 trillion miles) away. (Or, since we’ve been using astronomical units, Alpha Centauri is about 300,000 AU’s from the sun). If we scale Earth down to a grain of sand, then Alpha Centauri would be over 6 miles – or 10 kilometers – away. 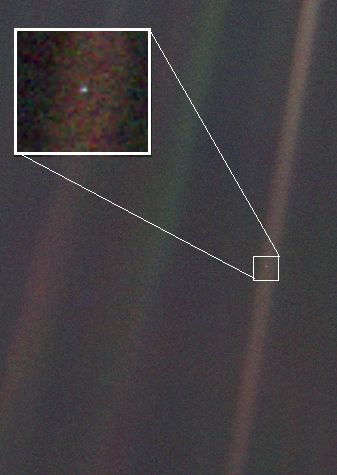 Meaning.. Alpha Centauri is ridiculously far away in human terms. In fact – it’s so far away that it would take light, traveling at the universal speed limit, 4.3 years to journey there. As we know, nothing travels faster than the speed of light – not least of all the Voyager spacecraft. Traveling at its current speed, it would take Voyager 1 at LEAST 73,000 years to come anywhere near Alpha Centauri – IF the spacecraft was even headed in that direction. Currently, the Voyager 1 spacecraft is powered by three nuclear batteries, known as radioisotope thermoelectric generators. They operate by converting heat released by the decay of plutonium-238 fuel into electricity. (Plutonium-238 decays with a half life of about 87.7 years). In 2001, it was revealed that the power source on both Voyagers were diminishing unexpectedly – only performing at 67% of their original capacity, instead of the expected 83.4% – leading some to believe that in another ten years, the batteries will no longer power the spacecraft – causing each of the remaining four functional instruments to shut down. This would prohibit us from making any additional contact with the spacecraft – as well as keeping the spacecraft from relaying data back to Earth from interstellar space. However, one comforting thing to remember is that long after we are gone; after the sun becomes a red-giant, engulfing the inner planets and incinerating the remnants of Earth (“the only home we’ve ever know”), Voyager will remain. A piece of Earth will remain. 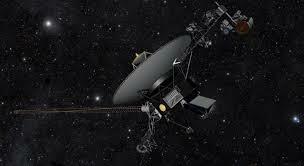 Even if the spacecraft is relegated to roaming the celestial abyss for the rest of eternity – without another hapless species stumbling upon it – Voyager is still a part of us. It immortalizes us, even after the body of the last living homosapien is destroyed. That, my friends, is Voyager’s legacy. Moving the Earth: Could this be a Global Warming Solution? What Would Our Solar System Be Like if Our Sun Were Half its Mass?